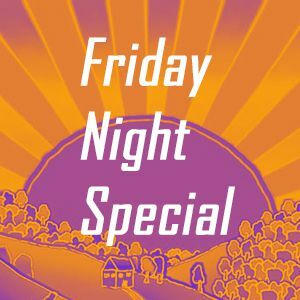 At Roma Explorers Inn, our Roma Restaurant is thrilled to announce the vast array of different cuisines on offer for our Friday night specials menu. Each week we will offer a different cuisine, consisting of 3 separate plates; an entree, main and dessert. Our guests have the option of selecting individual plates at $12 for entree, $22 for mains, and $8 for dessert. The second option, is as we recommend, the value option, at $30 for all three plates. 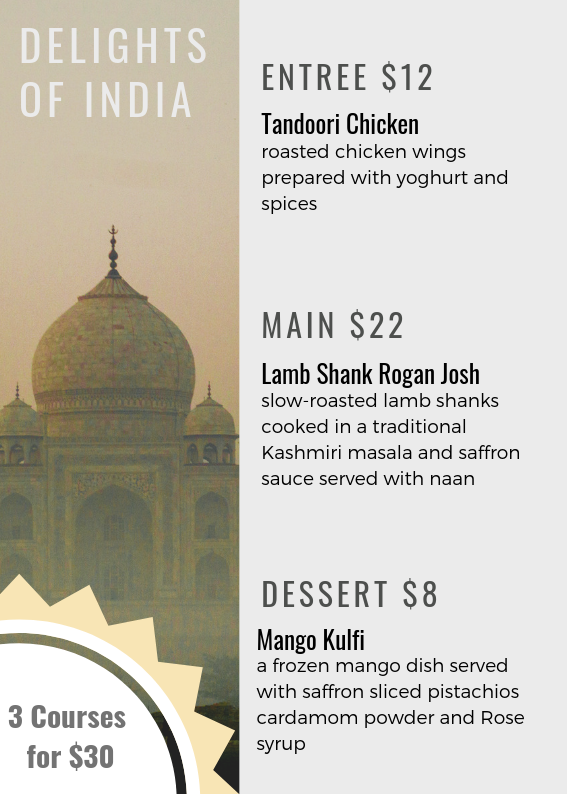 For our first special, we have ‘Delights of India’. For our entree, we have Tandoori Chicken wings, prepared with yoghurt and spices. For our main we have Slow roasted lamb shanks, cooked in a traditional Kashmiri masala and saffron sauce served with naan. For our third course, we have dessert which includes a Mango Kulfi; a frozen mango dish served with saffron sliced pistachios cardamom powder and Rose syrup. 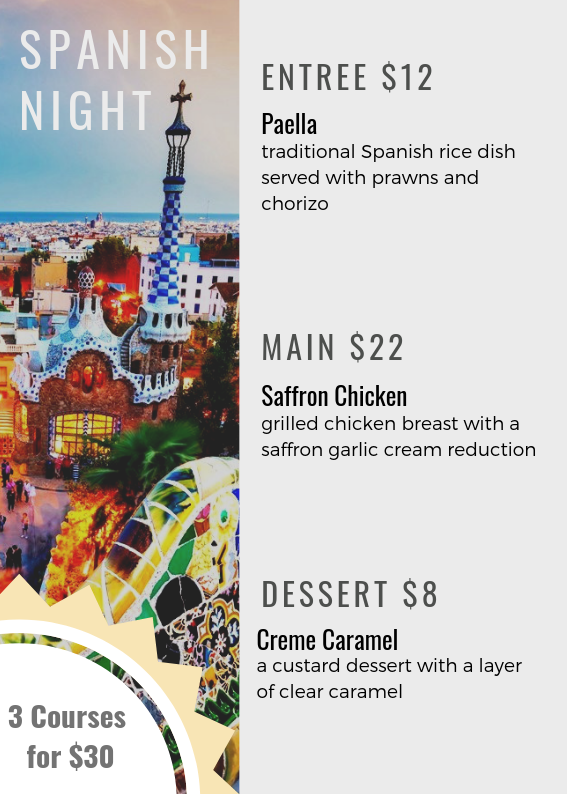 ‘Spanish Night’, our next cuisine is bound to give our guests the real culinary Spanish experience! The entree, a traditional Spanish Paella consisting of rice served with prawns and chorizo. For the main, Saffron Chicken, served with a saffron garlic cream reduction. Lastly for our Spanish Nights special, our dessert, the Creme Caramel. 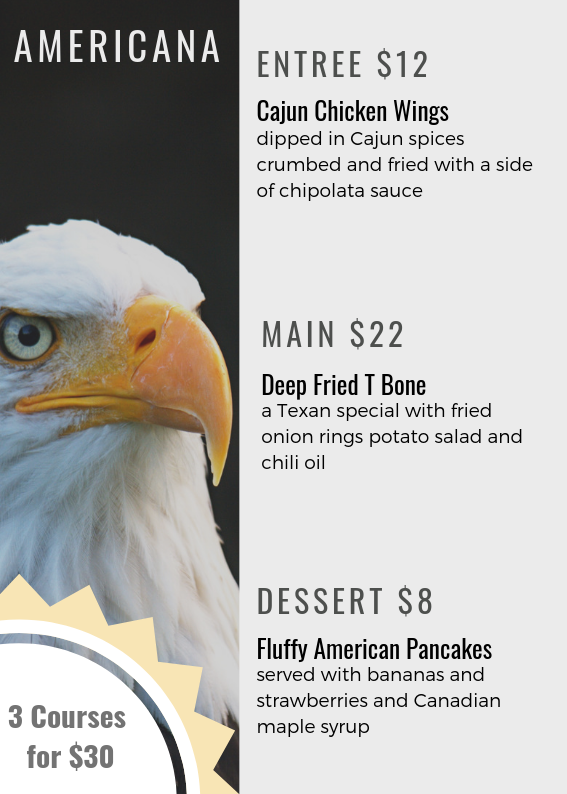 The next cuisine for our Friday night specials is Americana. For entree, we have the very popular, Cajun Chicken Wings on order, served with chipolata sauce. For our main we have the Deep Fried T Bone steak, served with fried onion rings and potato salad. For dessert, we have the classic American style fluffy pancakes, served with bananas, strawberries and Canadian maple syrup. ‘Taste of Greece’ is the next cuisine! 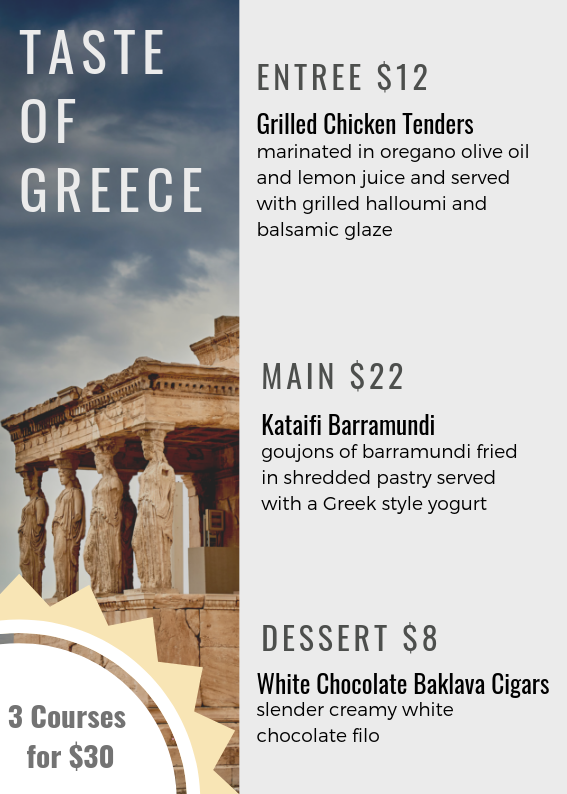 The entree includes the very popular, Grilled Chicken Tenders, marinated in oregano olive oil, and lemon juice, served with grilled halloumi and balsamic glaze. For our main, we have the Kataifi Barramundi. Fresh goujons of barramundi fried in shredded pastry, served with Greek style yoghurt on the side. For dessert we have White Chocolate Baklava cigars. Finally, our last cuisine, Asian Fusion. For entree, we have an array of Asian delights. Spring rolls, dim sim, samosas, prawn cracker, all served with a sweet chili and soy dipping sauce. 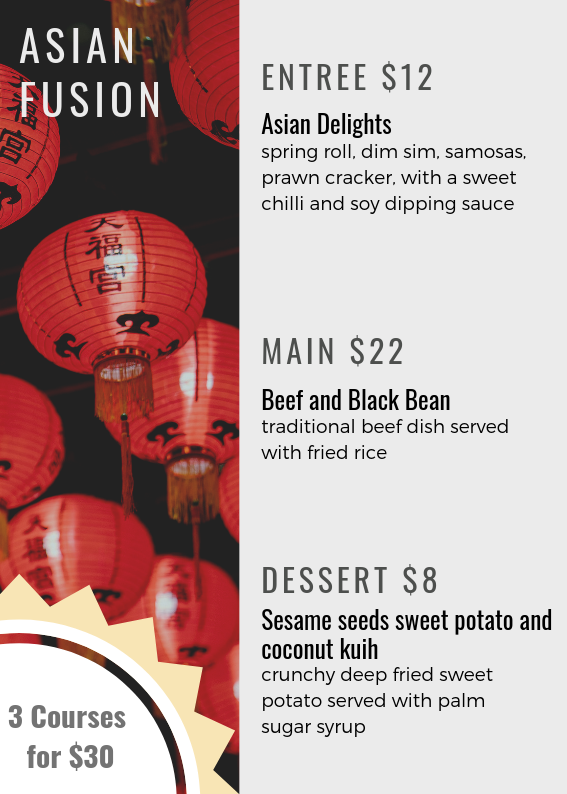 For our main, we have the Beef and Black Bean traditional dish, served with fried rice. Our Asian Fusion dessert, consists of a Sesame Seed, Sweet Potato and Coconut Kuih; crunchy deep fried sweet potato served with palm sugar syrup on the side. With these large range of cuisines, we hope to see our guests at The Roma Explorers Inn, for a cultural culinary experience they won’t forget!